Yesterday we went to Wilson Farm in Lexington, MA for a farm tour (will post about it next week). We got there early and walked around their market. If I lived closer I would do all of my food shopping here. They sell tons of fruits and veggies grown there on the farm, high quality grocery items, natural antibiotic and hormone free meats and fresh flowers. I'm sure you can guess where I hung around most in the store. I couldn't leave without bringing home a bunch of sunflowers. Grown here on the farm, these flowers will have a long vase life. A lot of folks think sunflowers are a fall flower but these babies start becoming readily available in the summertime. 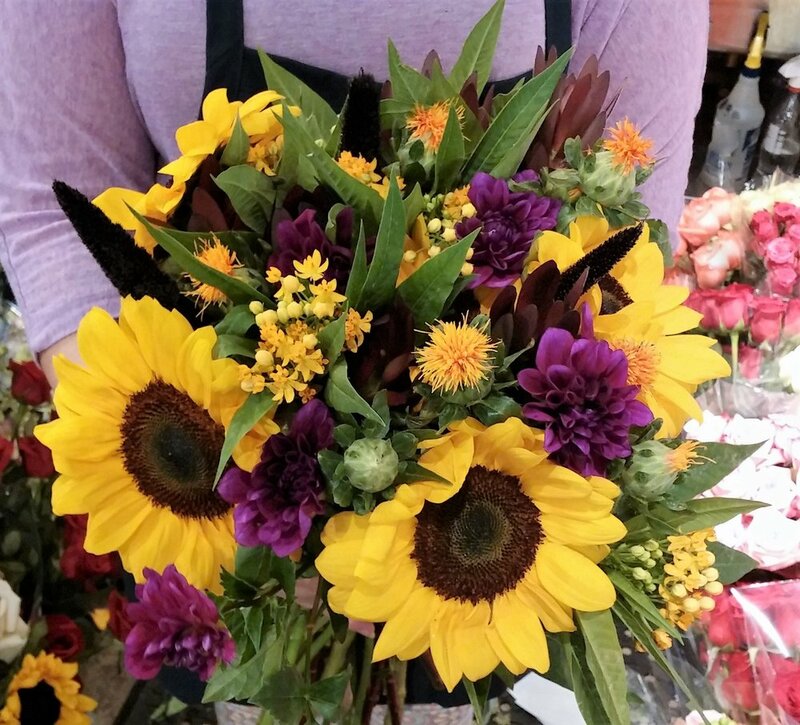 Commonly seen as a yellow flower, sunflowers are also available in brown, burgundy, pale yellow, ruby red and orange. I was drawn to the traditional yellow, large sized blooms! They are literally picture perfect. - Sunflower is the state flower of Kansas, USA. - Sunflower is notable for turning to face the Sun, a behavior known as heliotropism. - Sunflower heads consist of 1,000 to 2,000 individual flowers joined together by a receptacle base. The large petals around the edge of a sunflower head are individual ray flowers which do not develop into seed. - According to the 1996 Guiness Book of Records, the tallest Sunflower ever grown measured 25 feet 5 and 1/2 inches. According to the 1996 Guiness Book of Records, the smallest sunflower ever grown to maturity measured 2 and 1/5 inches. According to the 1996 Guiness Book of Records, the largest sunflower head measured 32 and 1/4 inches across. As with all cut flowers, give them a fresh cut before you arrange them. Make sure you use a clean vase, cut flower preservative and cold water! To extend the life of your cut flowers, change the water and recut them every couple days. I am excited to use sunflowers for a 1st birthday party next month. The theme is You Are My Sunshine- seriously HOW CUTE?! 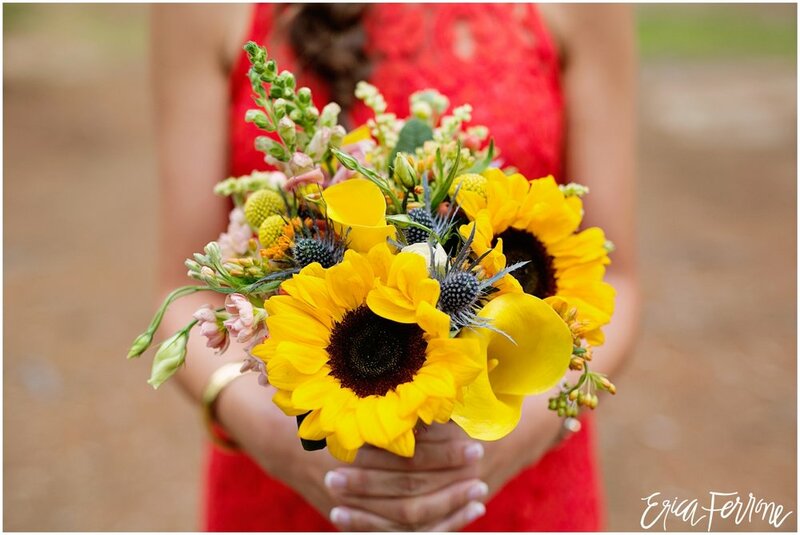 Sunflowers are a perfect focal flower for weddings with rustic theme. And absolutely show stopping when mixed with purples! Let me know what flower you want to see next! Support your local farmers, grab a bunch of sunflowers to brighten up your home, and as always live your best life.